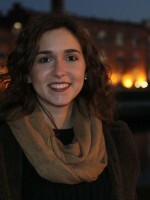 Inês S. Cardoso is currently a PhD student in CICECO - Aveiro Institute of Materials in Chemical Engineering. She is working under the supervision of Dr. Mara G. Freire and co-supervision of Professor Dr. Armando J. D. Silvestre with the theme ''Integrated recovery processes for high-value bioactive compounds from agroforest by-products using ionic liquids''. Born in March, 15th of 1993. She has completed her bachelors degree in Biotechnolgy in 2014 and her MSc in 2016 in Industrial Biotechnology, both done in the University of Aveiro.